ที่โดดเด่นคือ "Jsem Moravan" และ "Moravo, Moravo"
↑ Czech Lion (14 May 2016). "Anthem of Moravia - "Moravo, Moravo"" – โดยทาง YouTube. ↑ ARTEGA. "Kraje v ČR - počet obyvatel, hrubá mzda a nezaměstnanost". ↑ Royal Frankish Annals (year 822), pp. 111-112. ↑ Morava, Iniciativa Naša. "Fakta o Moravě – Naša Morava". ↑ Bowlus, Charles R. (2009). 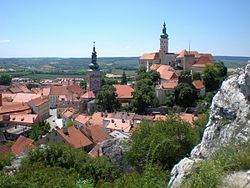 "Nitra: when did it become a part of the Moravian realm? Evidence in the Frankish sources". Early Medieval Europe. Oxford, UK: Blackwell Publishing Ltd. 17 (3): 311–328. doi:10.1111/j.1468-0254.2009.00279.x. สืบค้นเมื่อ 2013-08-27. Galuška, Luděk, Mitáček Jiří, Novotná, Lea /eds./ (2010) Treausures of Moravia – story of historical land. Brno, Moravian Museum. ISBN 978-80-7028-371-4. David, Jiří (2009). "Moravian estatism and provincial councils in the second half of the 17th century". Folia historica Bohemica. 1 24: 111–165. ISSN 0231-7494. Svoboda, Jiří A. (1999), Hunters between East and West : the paleolithic of Moravia. New York, Plenum Press ISSN 0231-7494. Absolon, Karel (1949), The diluvial anthropomorphic statuettes and drawings, especially the so - called Venus statuettes, discovered in Moravia New York, Salmony 1949. ISSN 0231-7494. Šimsa, Martin (2009), Open-Air Museum of Rural Architecture in South-East Moravia. Strážnice, National Institute of Folk Culture. ISBN 9788087261194.